Enable VET Student Loans for the required company and enter the VET Student Loans Provider Code. For testing with HEIMS, you can use the test Provider Code 9998. As VET Student Loans also uses a number of Avetmiss Fields, ensure Avetmiss is also enabled. Specify the Funding Supplier (this should be VET Student Loans), Bank Account and Receiving Station for use in Invoicing VET Student Loan Payments. 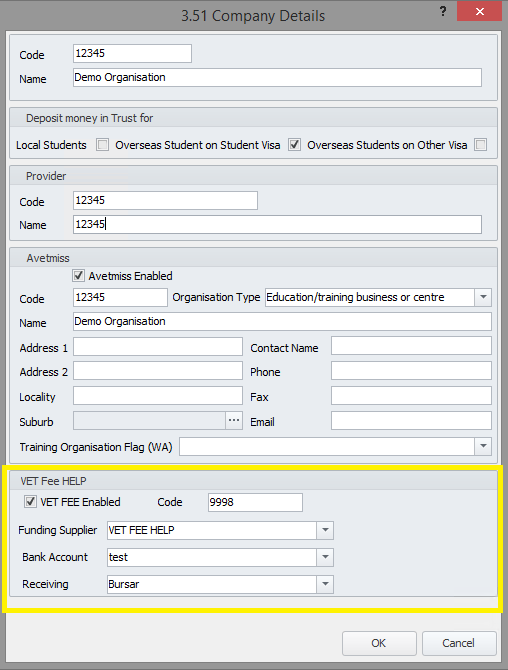 Ensure the program to be set-up for VET Student Loan enrolments is part of a VET Enabled Faculty and is VET Enabled with VET details completed. 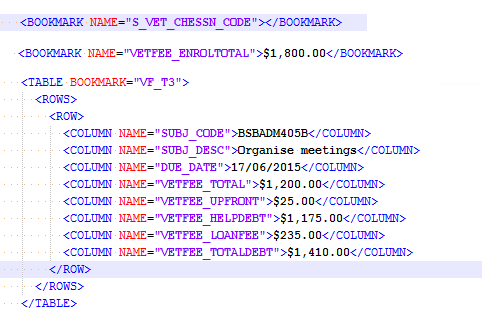 VET Student Loans reporting also uses some details completed as part of AVETMISS reporting. To enable a Program for VET Student Loans, check the VET Student Loans Enabled check box and complete the required details. The EFTSL (Effective full time Study Load). 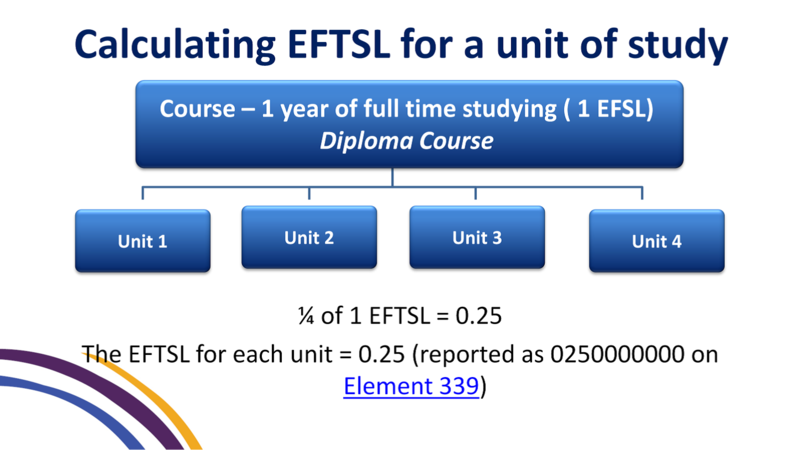 Below is an example for calculating EFTSL for a 1 year Full time course with 4 units of study. 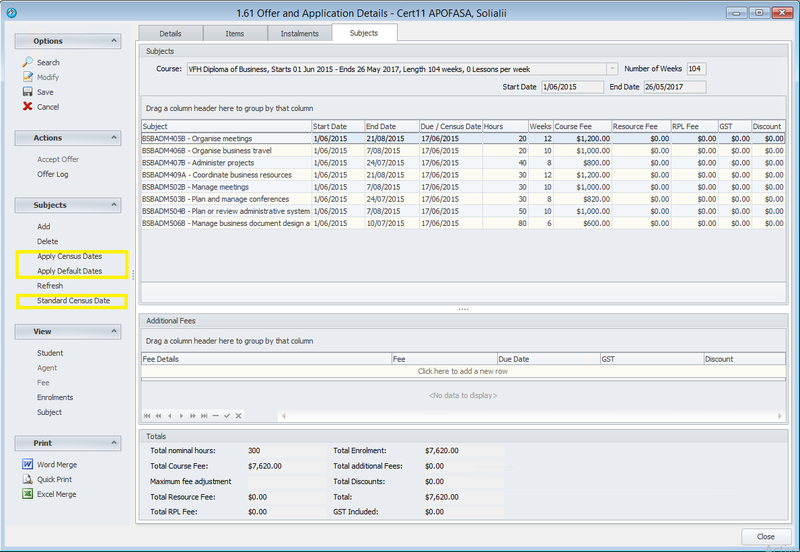 The Calculate EFTSL Action can be used to fill the EFTSL value for a Course. This will assume the Course is full time, you will need to adjust for Part Time or Fast Tracked Programs. Each Program you set up under the same Scope / Course Code must have the same EFTSL value. For Subjects, the EFTSL is calculated for the Program it is attached to as a Fraction of the Program EFTSL. eBECAS will calculate this evenly for each subject: if the proportions are different, modify accordingly. 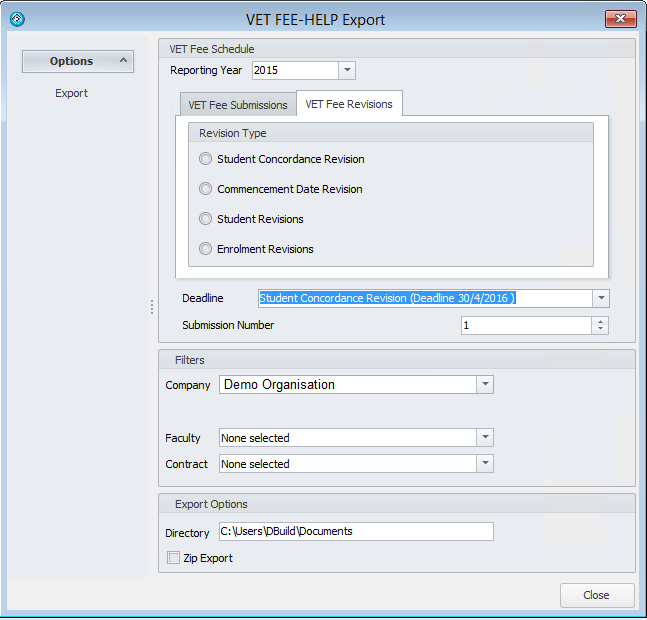 Ensure the Subject is VET Enabled and VET fields completed as they are also used for VET Student Loans reporting (in particular the Field of Education). The EFTSL (Effective full time Study Load) will also need to be calculated for Subjects for each Course they are linked. See above for details on calculating the EFTSL. Ensure a Subject Length has been entered, as this is used to calculate the Census Date for the unit (20% of the subject length). 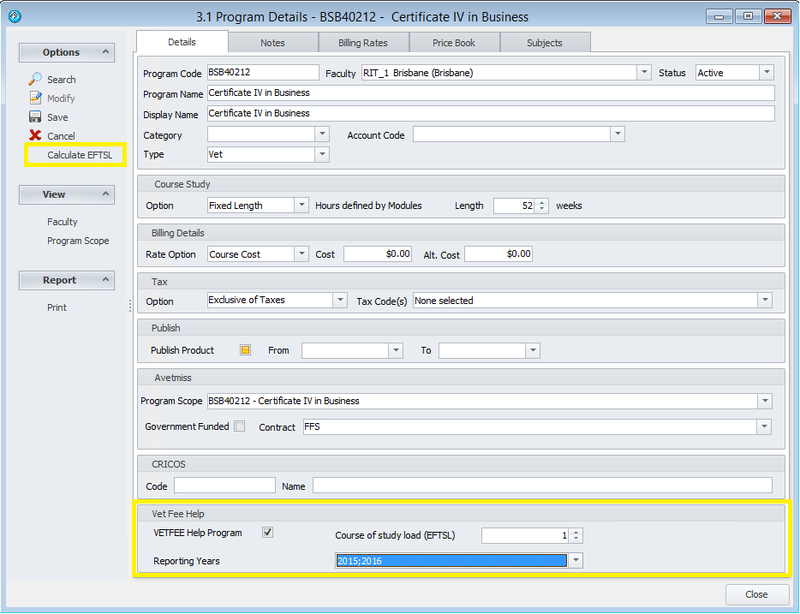 Ensure the Subject has Subject Based pricing setup and the price has been entered correctly. Ensure the Student Name, Title, Date of Birth and Address Details (on the Address Tab) are filled in correctly. Ensure the VET & HE Section has been completed – as well as the CHESSN and Tax File Numbers specific to VET Student Loan, a number of Language, Disability, and Education & Employment fields in the VET & HE section are also reported. A Vet Student Loans funded Offer is set up using Subject Pricing. When creating the offer, Instalments are setup for each Subject to be enrolled. The Price per Subject is set-up for each Subject (See above). 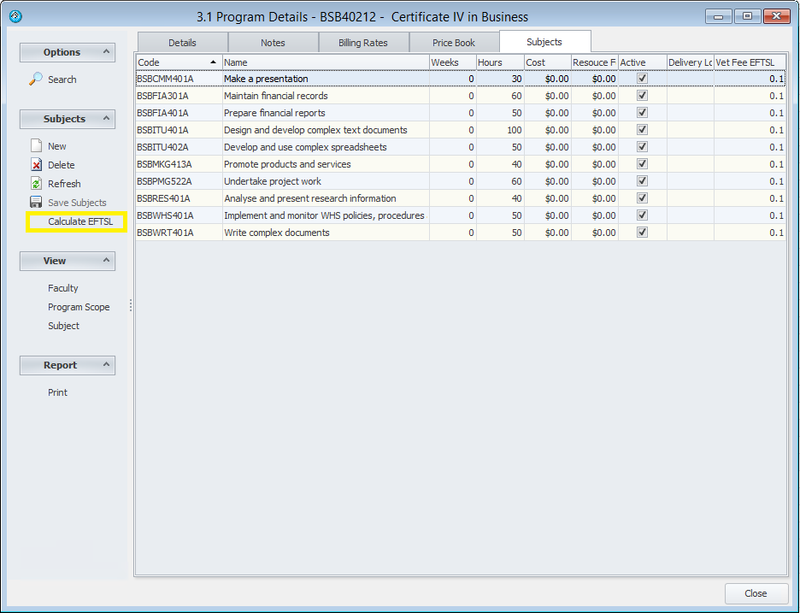 Once a VSL Enabled Course is added as an Item, the Subjects tab is available. 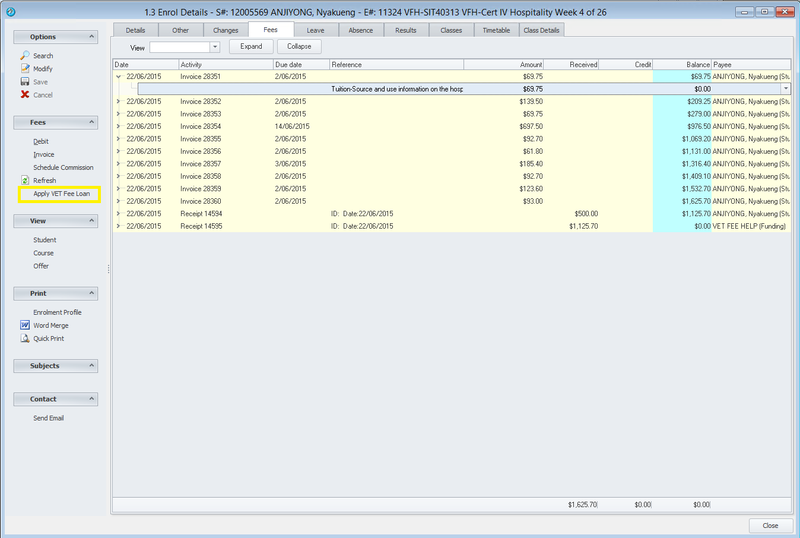 Ensure the Program Start Date has been entered before setting up Subjects. The Course Fee per Subject can be modified here if required (not recommended). The Census data can also be calculated for each Subject to be enrolled. 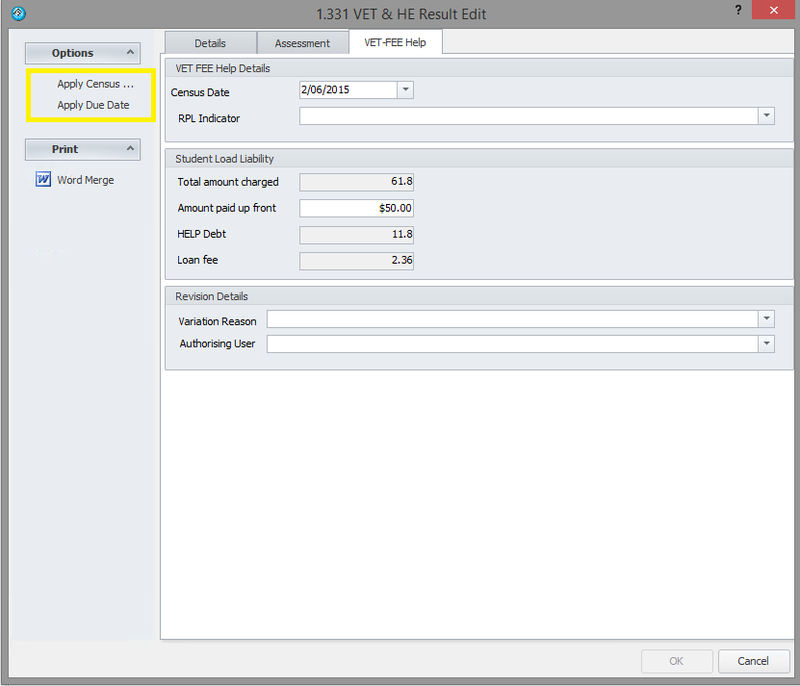 Enter the expected Start Date, the End date is calculated based on the Length of the Subject. Click Apply Census Dates to calculate the Census Date (20% of the Subject length). Census date can be any date from this date onward, up to the End Date for the Subject. Use the Apply Default Dates to set the End Date as the Census Date. Use the Standard Census Date action to calculate a Single Census Date for all subjects. This will be the minimum possible Census date that is appropriate for all subjects. To create the enrolment, save and click Accept Offer. For VET Student Loan Enrolments, a number of additional fields are required. These are found under the Other Tab, below Avetmiss Details. Once accepted, Invoices are created for each subject. Upfront Payments can be made up to the Census Date, when the remainder is reported as the VET FEE HELP Debt. Payments made toward tuition by a student will also be stored in the VET Student Loans Upfront payments and used to recalculate the Loan Debt and Loan Fee (see below, Results). Once the Census Date has passed, use the Apply VET Student Loan Action to create a receipt and calculate the payment made through VET Student Loans. For a VET Student Loan enabled Enrolment, the Vet Student Loan tab will be displayed for all Results. This contains the Census Date, as well as number of fields to be completed. If eBECAS invoicing is not used to receipt student payments, the Amount Paid up-front will need to be entered here. This will calculate the Loan Debt for each Subject (the remainder of the Subject Cost) as well as the Loan Fee (calculated at 20% of the Loan Debt). Enter a Variation and the User Authorising the Variation if Enrolment Results need to be modified after the Student Submission has been reported. This will also ensure the record is reported as part of a VET Student Loan Help Revision. The Census Date should be assigned when setting up the Offer (see above). The Census Date can also be re-calculated here – as 20% of the Subject Length by Clicking Apply Census Date. Although 20% is the minimum Census Date, it can be entered as anything up to the End Date of the unit. When recalculating or re-entering the Census Date, the option to reset the Due Date for the associated Invoice will also be given (if the Census Date has not passed). If the Census Date has passed-the option to modify the Census date and upfront payment will not be available. For each VET Fee Help year, there are a number of required Submissions as well as optional Revisions. The Schedule for each year will set when these are required to be submitted. 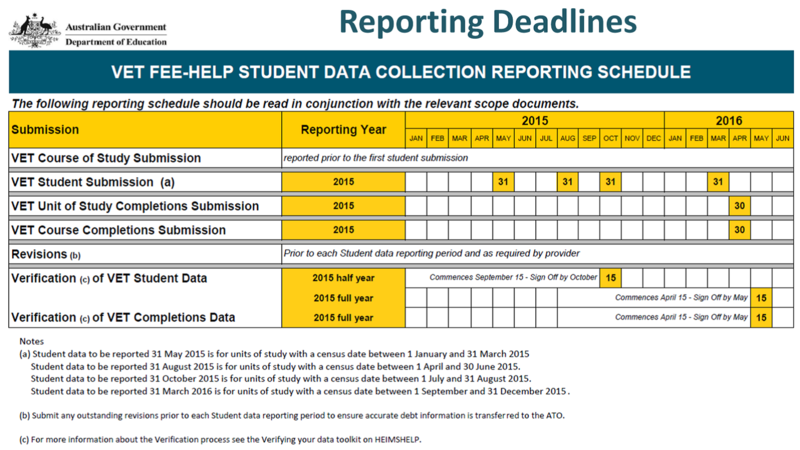 Below are the reporting Deadlines for 2015. eBECAS has all Collection Deadlines loaded along with associated Census Dates that will filter the Enrolments and Results to be reported for each Submission. To create a new VET Student Loan Submission, open Utilities->Vet Student Loan from the Main Menu. Select the Reporting Year and Submission Type. Select the Deadline being reported. The Submission Number will track the number of submission that have been generated and increment. Reset this back to 1 as required. Select the Company being reported. Filter the Submission by Location, Faculty and Contract. Click Export and files are generated in the Export Directory Specified, ready for Import and Validation into the HEPCAT reporting tool. (Details here: http://heimshelp.education.gov.au/sites/heimshelp/resources/toolkits/pages/reporting-with-hepcat ). Revisions are used to report changes to data after the initial Submission. Use the Student Concordance Revision to report any Student Number Modifications made for VET Fee Help Enrolled Students already reported in the Student Submission. Use the Commencement Date Revision to report any changes to Enrolment Dates. Use the Student Revision and Enrolment Revision to report changes to Results and Student Details. A Variation will need to be indicated on the Results form (see above) to report Student and Enrolment Revisions. A CAN should be sent to VET Student Loan students after the Census Date for Enrolment. Any VET FEE-HELP loan fee incurred. For Details on setting up the Template for a CAN letter, refer to the Online manual here. 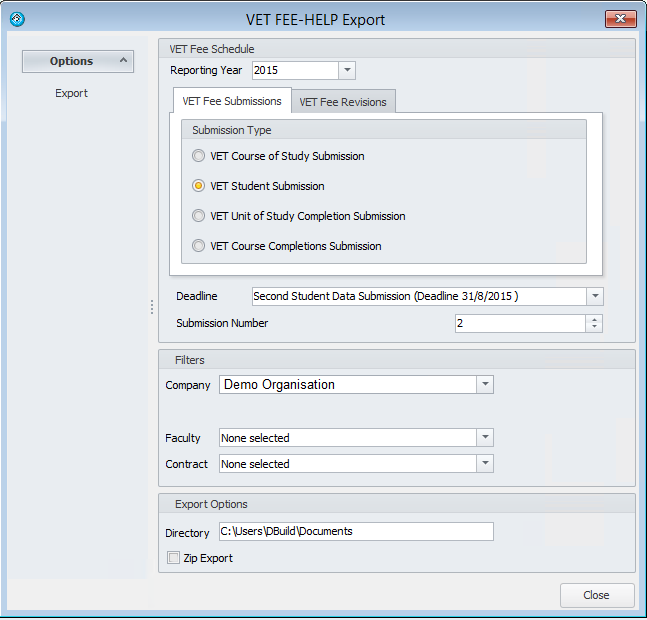 HEPCAT Toolkit – The Reporting with HEPCAT toolkit provides you with the information you need to report your data to the Higher Education Information Management System (HEIMS). Getting Started Webinar – The purpose of this webinar is to provide information and support to recently approved providers who are new to reporting.